Facebook’s next data center will be located in Fort Worth, Texas. Fort Worth will join the social network’s existing data centers in Altoona, Iowa; Prineville, Ore.; Forest City, N.C.; and Luleå, Sweden. Like its predecessors, we expect Fort Worth to be one of the most advanced, efficient and sustainable data centers in the world. Our continuing work on data-center design is an important part of our overall infrastructure efficiency efforts, which have helped us save more than $2 billion in infrastructure costs over the past three years. And like its immediate predecessor, Fort Worth will be powered by 100 percent renewable energy, thanks to the 200 megawatts of new wind energy we helped bring to the Texas grid as part of this deal. Thanks to our continued focus on efficiency and our investments in renewables in recent years, the carbon impact of one person’s use of Facebook for an entire year is the same as the carbon impact of a medium latte. We put a lot of effort into choosing where to locate a facility like this. There are a lot of things we look for—everything from a shovel-ready site, to access to renewable energy, to great partnerships with the local community to a strong pool of local talent for construction and long-term operations staff. We think we’ve found all that and more in Fort Worth, and we’re excited to be getting started. Readers: What do you think of Facebook’s selection of Fort Worth? 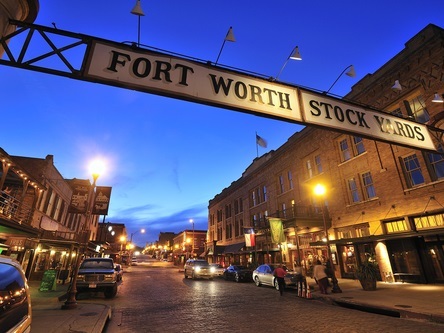 Fort Worth Stock Yards image courtesy of Shutterstock.